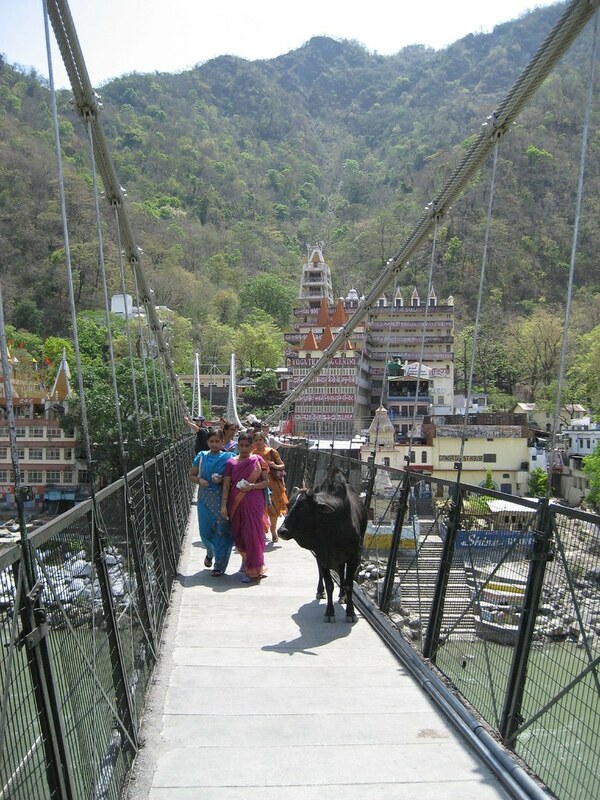 Rishikesh is a smallish town set on the Ganges at the foothills of the Himalayas. In part due to it’s “auspicious” location it’s a pilgrimage site for Hindus. But of late there are a lot of other people here besides Hindus. In addition to being “auspicious” the location is gorgeous, the hills ascend up from the river dramatically with high banks on either side, in the middle there are a pair of pedestrian bridges that link the two sides of town, and there are Hindu Temples all around, it’s quite picturesque. Which begins to explain why since the mid-sixties westerners have been coming here in droves. You can blame it on The Beatles. They came here in their Maharishi phase (and wrote much of “The White Album” here), along with the Beach Boys and an assortment of Hollywood types. Since word has gotten out about the place it seems it’s been hard to keep the flow of Westerners away. And the folks here are pretty smart – the over building that seems to happen in many Indian cities has been kept to a minimum, people are fairly respectful of you, even the Touts are almost polite as they try to sell you things you don’t want or have no use for. LeeAnne and I have been here the better part of a week chilling out, doing some Yoga, and generally “re-grouping” (Re: Recovering from a cold in her case, and a nasty stomach something in my case). Luckily this is a very good place to do just this sort of thing. Which may be why half of Israel is here. I swear, we’ve had an opportunity to learn as much Hebrew as Hindi since our arrival – it’s almost laughable. I don’t think I’m exaggerating when I say 8 out of 10 westerners in town are Israeli hippies. Before you say it – I know, I know – if you don’t like hippies don’t go to the greatest population center of hippies in India of all places, but here I am. As for the Yoga, let’s say their idea of “Beginners” level classes here are not the same as ours in the States. In the second class the instructor started off the class by having people do headstands, you know, where you stand on your head!?! Half of the people in the class still had money-belts on. But surprisingly, some people pulled it off. I have now idea what the hospital bills were like.